This is another beer I obtained in a trade however the result was a lot better than the Gunga Galunga. Russian River makes some great beer with the most popular being Pliny the Younger and Pliny the Elder. 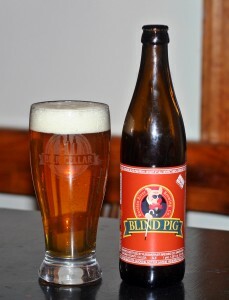 Blind Pig often flies under the radar but really should get more acclaim as it is a great IPA. This beer is super clear with a very nice white cap. Aroma is all hops with lots of tropical, grapefruit and citrus. Very appealing beer in both appearance and smell. Taste does not disappoint with those same hops coming though with a slightly bitter finish. Being a single IPA with 6.1% ABV this beer is very easy to drink and the 500 ml bottle was gone very quickly. If you are able to get Russian River in your area than you probably already know how good this beer is. If you live in an area where you cannot buy it you should try to trade for some, it will not disappoint. Brewers Description: Full-bodied, very hoppy, citrus, pine, fruity notes with nice dry, bitter finish!